Mackay Airport (IATA: MKY, ICAO: YBMK) located in South Mackay, Queensland, Australia is a major Australian regional airport that services the city of Mackay, with flights to the cities of Brisbane, Rockhampton, Townsville, Hamilton Island and Cairns. In the year ending 30 June 2012, the airport handled 969,900 passengers making it the 14th busiest airport in Australia. The airport attracts a diverse range of carriers to service the travel needs of the business, commercial, industrial, leisure and visiting friends and relatives sectors. Mackay is a thriving mining, agricultural, industrial and regional business centre that also supports a growing tourism industry and is a gateway to the Whitsunday coast and islands. Moves to establish an airport at Mackay began in 1927, when Captain Ron Adair selected the site of the town commons for the construction of an aerodrome, and landed the first plane in Mackay there, his own Avro biplane. 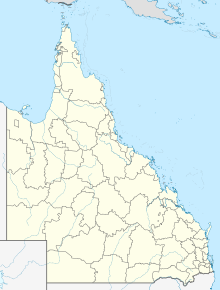 [dubious – discuss] The Mackay City Council agreed in February 1930 to apply to excise land from the commons for aviation purposes, and the controller of civil aviation in Australia issued an airport licence on 9 March 1931. The airport opened later that year. In 1938, the airport held an airshow featuring ten aircraft, which attracted over 8,000 spectators. Mackay Airport had grass landing strips until 1940, when the Commonwealth Government extended the airport's boundaries and upgraded the runways to unsealed gravel for use during World War II. Until 1945, Mackay Airport served as an important operational military base due to its proximity to the South West Pacific Area. In 1948, the main runway was extended, and in 1958 it was further upgraded, sealed and strengthened. In 1941, the Commonwealth Government took control of the airport from the Mackay City Council, and built a new passenger terminal in 1953. In 1984, the government offered control of the airport back to the council, which refused. It then offered the airport to the Mackay Port Authority, then changed its mind and announced the airport would be run by the Federal Airports Corporation. This move prompted an angry local reaction in Mackay, which eventually led to the port authority gaining control of the airport. Mackay Airport is used by most major airlines operating in Australia: Qantas subsidiaries QantasLink and Jetstar and Virgin Australia. Despite the collapse of airlines Ansett Australia and Flight West Airlines in 2001, Mackay Airport has experienced considerable growth in recent years, due to the use of the airport by Virgin Australia and the expansion of QantasLink services, and handles over 620,000 passengers through the terminal per annum. In November 2008, Mackay Airport was sold to a private consortium to fund the development of Mackay Hospital. In the year 2008, the airport handled 837,416 passengers making it the 15th busiest airport in Australia. In January 2010, Auckland International Airport Limited, announced plans to purchase almost 25 per cent of North Queensland Airports (NQA), operator of the airports at Cairns and Mackay, for about $167 million. Synergies for Auckland Airport with North Queensland Airports include better management of the airports' operations and working more closely with each other to attract airlines that currently don't fly to either. NQA stands to be a good stand-alone investment for future economic growth for the state of Queensland, as international tourism for the area of Northern Queensland increases, thus, illustrating a significant increase in demand for future international flights to the airports. In September 2015, Tigerair Australia announced they were suspending the Mackay-Melbourne service due to decline in passenger numbers. Jetstar Airways ran a Mackay-Gold Coast route from June 2014 until September, 2015. It was also suspended due to a small number of passengers. In March, 2016 Regional Air began regular charter flights between Mackay and Hamilton Island. ^ a b c "Airport Traffic Data 1985–86 to 2010–11". Bureau of Infrastructure, Transport and Regional Economics (BITRE). May 2012. Archived from the original on 24 March 2012. Retrieved 8 May 2012. Refers to "Regular Public Transport (RPT) operations only"
^ "Treasurer announces successful sale of Mackay airport". Retrieved 2017-01-29. ^ "Tigerair to end Mackay – Melbourne Service - Mackay Airport". www.mackayairport.com.au. Retrieved 17 September 2016. ^ "Jetstar to end Mackay – Gold Coast Service - Mackay Airport". www.mackayairport.com.au. Retrieved 17 September 2016.